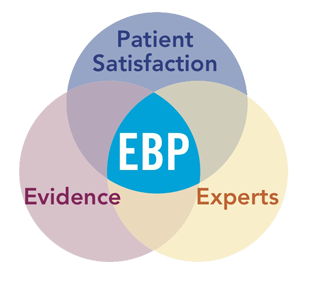 Evidence-Based Practice (EBP) occurs when the following three components intersect: evidence that a treatment works; an expert who provides the treatment; patients who enjoy and profit from the treatment. After all, what good would a therapy program be that was effectively administered by an expert if the patients thought it was boring? Parkinson Voice Project provides extensive training to our clinical staff (experts); our therapy programs are effective, fun, and interesting (patient satisfaction); and now, we are grateful to have independent researchers in the speech-language pathology community proving the efficacy of SPEAK OUT!® and The LOUD Crowd® (evidence). Levitt, J.S., Walker-Batson, D. (2018). The Effects of the “Speak With Intent” Instruction for Individuals With Parkinson’s Disease. Journal of Communication Disorders and Assistive Technology, 1: 1-15. Levitt, J.S. (2014). A Case Study: The Effects of the “SPEAK OUT!®” Voice Program for Parkinson’s Disease. International Journal of Applied Science and Technology, 4(2), 20-28. Behrman, A. & Cody, J. (2018). Outcome of SPEAK OUT!® for Adults with Parkinson’s Disease. Poster presented at the annual American Speech-Language-Hearing Association Convention, Boston, MA. Parveen, S., Headrick, K., Payne, N. (2018). Long-Term Effects of a Group Based Intervention among Individuals with PD. MDS-PAS Conference, Miami, FL. Cleveland, L., Pimentel, J., Talarico, M., Solomon, J., & Eastern Washington University. (2015). Vocal Intensity and Speech Intelligibility Pre- and Post-SPEAK OUT!® Treatment. Poster presented at the annual American Speech-Language-Hearing Association Convention, Denver, CO.
Cody, J. & Elandary, S. (2015). 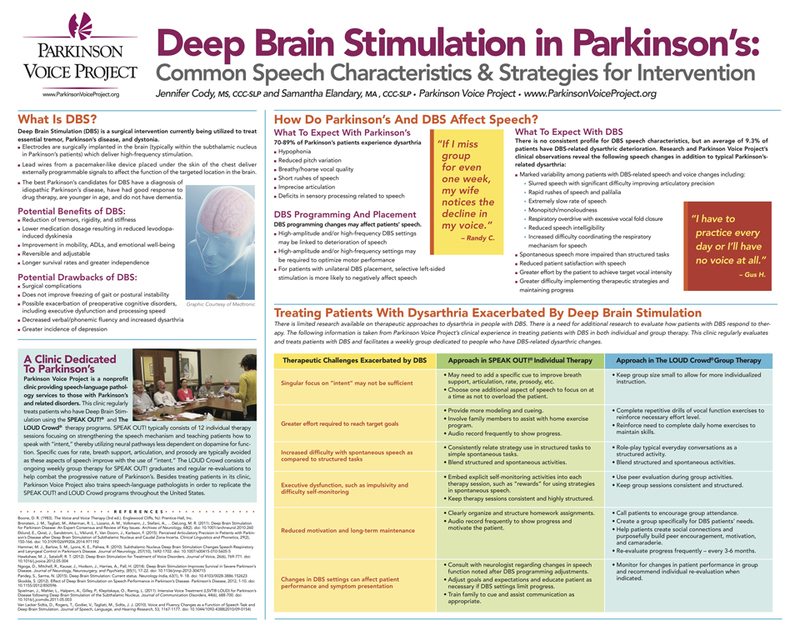 Deep Brain Stimulation in Parkinson’s: Common Speech Characteristics & Strategies for Intervention. Poster presented at the annual American Speech-Language-Hearing Association Convention, Denver, CO.
Park, E., Santos, C., Dvorak, J.D., Gates, J., & Boutsen, F.R. (2015). The Effect of SPEAK-OUT!® Voice Therapy on Prosody in Persons with Parkinson’s Disease. Oral presentation at the fifth annual College of Allied Health Research Day, Oklahoma City, OK.
Levitt, J.S., (2014). The Effects of the “SPEAK OUT!®” and “LOUD Crowd®” Voice Programs for Parkinson Disease. Poster presented at the annual American Speech-Language-Hearing Association Convention, Orlando, FL.